In our family, few things say vacation like a box of Pop-Tarts. We like the frosted kind with the vaguely cinnamony filling, the ones that make that whispery sound when you break them in half. Within an hour of dumping our luggage, we’re at the supermarket, stocking up on all the staples that sustain a family–milk, pasta, fruit–as well as a few that definitely don’t: ice cream bars, Frosted Flakes, those Pop-Tarts. Why? Because it feels good to take a break from saying no all the time, because we believe that vacation is a time to indulge every vice, to let our food ids run wild. We wash down our post-beach white-bread grilled cheeses with Coke; we finish the Key lime pie; we top off the Gin and Tonic with another Gin and Tonic. Each day begins with a bowl of Apple Jacks and ends with a “smush-in,” which is what the kids call those marble slab ice cream places where we let them smush gummy bears into their cotton candy-flavored ice cream. If the mark of a successful trip is forgetting your everyday life, then we’ve gotten pretty good at vacation. When we return, though, the earth assumes its normal rotation, and our old selves reemerge. We make food amends. 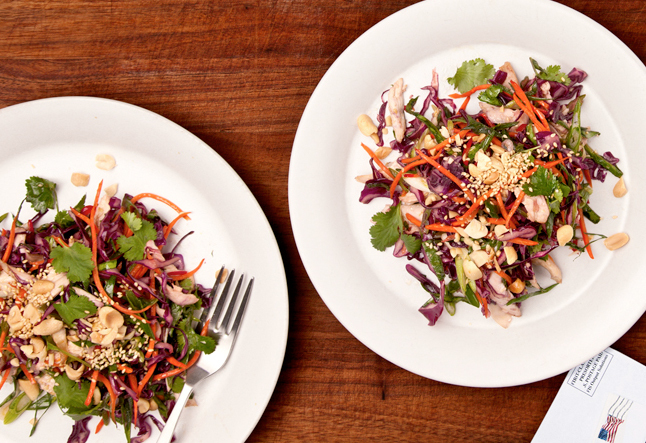 Our first dinner is usually Redemption Salad: chicken tossed into a mound of Asian-style, nutrient-dense, guilt-erasing shredded red cabbage and spinach. It’s our way of saying, Okay, that was fun, but now it’s time to get back to business. If it’s possible for a meal to make you feel healthy–to actually undo seven days of poor habits–this is the one. It also happens to taste good, which softens the landing a bit. But only a bit. This is our Providers column for the June issue of Bon Appetit. Head over to their site for this recipe and for the entire Providers archive. Photo by Danny Kim for Bon Appetit. Oh my goodness, I hear ya! We are on day 2 and so far I have consumed a southern fried chicken dinner (complete with cole slaw, rice, and apple pie of course) and a lunch out of two (rather large) slices of pizza. I have to say though, I balanced it out with a pretty long (too early) morning walk with the bebe by the ocean. Does sleeping in ever truly return to families? Cheers to vacation, and to that extra gin and tonic! I love this post! I’m a pediatrician, and we tend to have pretty healthy meals at home. But vacation time — that means vacation cereals (Fruit Loops and Lucky Charms for the most recent trip), Trader Joe’s chocolate Joe-Joes, and fruit snacks. we do the same thing. vacation is usually a lot of “no restrictions” talk which translates to cheetos for breakfast and a beer with lunch. as much as i look forward to it, i look forward to coming back to my avocado and salad too. I think everyone struggles with this! Are you guys restarting good habits? “Mak[ing] food amends” makes it sound like what you did was wrong when in reality what you did was vacation well. I already have this salad on the menu for tonight! Because we are about to GO on vacation, where I will definitely be enjoying whatever I am in the mood for. The “whispery sound when you break them in half.” Ooooo, Jenny, you just took me way back. Thanks for that! OMG, this is just the salad I have been looking for. I got back from two weeks of GOOD eating in Totonto and was looking for a nice light Asian Salad. Perfect! I’ve found Pop Tarts in Paris. Evil. Already mentioned how much my family LOVED this salad. It got a two thumbs up from all four kids and is on what we call the make again list. What kind of dressing do you use on this salad? I adore your column in BA! I hear ya! Except I am a teacher, so our vacation is about 8 weeks, even if we just stay at home. Lots of ice cream, chips, and irregular meal hours. I try to balance out all this with lots of produce from our garden and farmers market. This will all end come fall, so we take advantage of it now! I like the idea of this! Valerie: The dressing is a soy-lime-brown-sugar-chili number. Head over to BA.com for the recipe! the words guilt and vacation can’t be use in the same sentence… they simply don’t match, specialy when it comes to food!!! Looks delicious, will have to try it. Reminds me of Nigella Lawson’s Vietnamese Chicken and Mint salad which we love. If you haven’t tried that one yet you’d probably enjoy it. We loved this salad. I served this with moistened rice paper and had everyone make their own salad rolls. Delicious! Thank you.